As one of the most visited attractions in Branson, the Titanic Museum now gives every visitor the chance to know some of the stories of the survivors at the ‘Survivors’ Wall of Stories which tells about the real experiences of those who were saved after that tragic maiden voyage. On a daily basis, Titanic Museum provides all visitors an exciting opportunity to experience what it was like aboard the ship and a chance to see 400 ship’s artifacts. As a standard part of the Titanic experience in Branson since it first opened, visitors are given a boarding pass with the name and information about one of the passengers or crew members who were on board the ship. This gives the visitors the chance to know whether or not the passengers survived by checking their name in the “Memorial Gallery,” where they can see a complete list of all passengers and crew members. After more than a century that the RMS Titanic met its fatal end, the story of the tragedy continues to mystify people worldwide. Out of over 2,200 passengers on board the ship, only 700 survived. Though many survivors and their family members were hesitant to talk about what they have experienced, others were willing to share their experiences. Below are some of the interesting stories shared by some of the survivors. Ruth Becker Blanchard, known before marriage as Ruth Elizabeth Becker, was one of the youngest passengers on the Titanic at 12 years old. Her story is inspirational that as a young girl, she was able to show such bravery, even in the face of a horrific disaster that few of us can truly picture the tragic incident. Ruth boarded the RMS Titanic along with her mother, younger brother and sister as second-class passengers. When the Titanic struck an iceberg and began to sink, Ruth’s mother managed to get into Lifeboat No. 11 with her two youngest children, but there was no room for Ruth, so she ended up in Lifeboat No. 13. Finally, RMS Carpathia came to the rescue. After several tense hours of waiting, Ruth was overjoyed to see her mother and siblings alive and well. 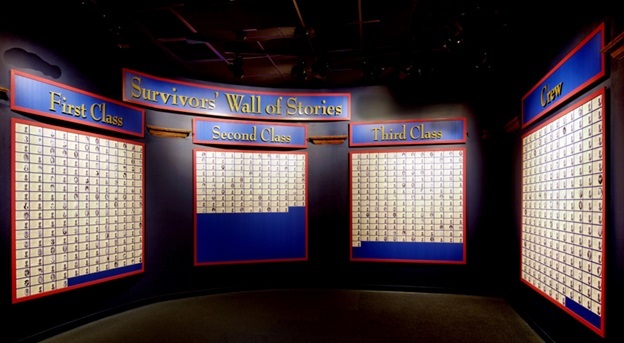 The ‘Survivors’ Wall of Stories section of the Titanic Museum is one of the newest attractions in Branson where you will learn real experiences of ship’s survivors.